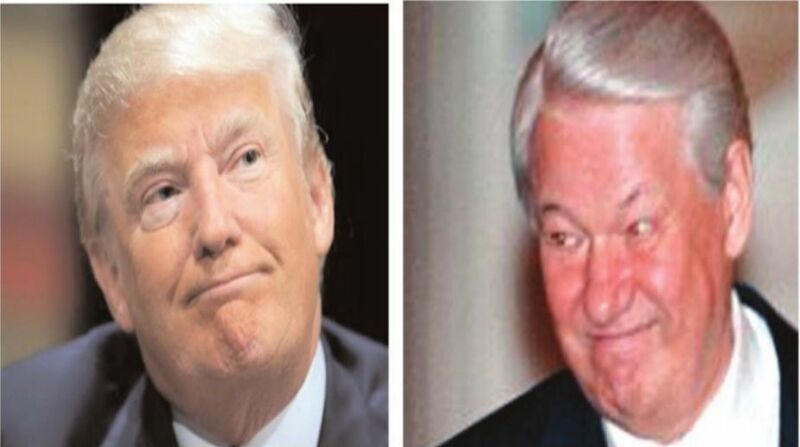 Russian president Boris Yeltsin had an excuse for his erratic behaviour. He was an uncontrollable alcoholic. US President Donald Trump has none. He is a teetotaller. Common to both of them was a loyalty to Russia. Historians examining the events of the past week will be forgiven for interpreting Trump’s imperious behaviour at recent international summits as being an unfinished chapter from ‘The Decline & Fall of the US Empire’. Never since the end of the end of the Cold War has any American president so carelessly or so wantonly eroded the position of his country’s pre-eminence in global politics. Trump’s first trip abroad as president looked perfect — on the drawing board. First stop: Saudi Arabia, the home of Islam. Next, Israel, the cradle of Judaism. After that, Rome, the bedrock of Roman Catholicism. And finally Sicily, the nursery of the Mafia. In Saudi Arabia, he received the genuflection from obsequious acolytes invited by his hosts from over 40 mainly Sunni Muslim countries. He lectured them (rather than his more culpable Saudi hosts) on the need to eradicate terrorism within their borders. In Europe, Trump told delinquent Nato members to pay up, or to shut up. At a stroke, he vitiated the very premise under which Nato had been created — as a united bulwark against communism. He then shrugged off US responsibility towards a common defence — ‘one for one, and one for all’. In essence, he reminded them that the American motto ‘E pluribus Unum’ may be expressed in a European language but it loses all meaning beyond the US East Coast. And in Sicily, at the G-7 meeting, he stood apart from fellow industrialised powers, creating almost overnight a new formula: G-6 +1. The final slight came when he told counterpart leaders that his decision on the Paris Agreement on climate change would be conveyed to them ‘after a week’. German Chancellor Angela Merkel reacted with incredulity. She looked as if she been treated as a door-to-door salesperson, told to come back next week. Given that every leader who is new on the job (except for repeat offenders) needs time to learn the tricks of the trade of leadership. Usually, they wait until they have had a chance of consolidating their base before soaring into the empyrean of international diplomacy. Trump, however, is a restless, ambitious Icarus without a wiser Daedalus to caution him. “For diplomacy to be effective,” his predecessor George W. Bush had once said, “words must be credible.” Trump believes what he is saying at any particular moment is automatically credible. For him diplomacy has less to do with credibility than with the power now available to him to browbeat other nations, to behave exactly in fact like other international bullies like USSR premier Nikita Khrushchev, and earlier still Adolf Hitler. Career diplomats in the State Department are wringing their hands in despair at seeing their president uncorking US policies that have taken decades to mature. They know that “diplomacy is more than saying or doing the right things at the right time”, as Bo Bennett once remarked, “it is avoiding saying or doing the wrong things at any time”. Trump, like some disoriented centipede, opens his mouth only to put his other 99 feet in. The vacuum in this geopolitical sinkhole created by Trump is being filled by Russia and by China. Russia is revenging the US-assisted disintegration of the USSR. It once conquered space with its sputniks and astronauts. Today, it has mastered cyberspace. When systems collapse or are infiltrated, the first reaction in the West is to dust the keyboards for Russian fingerprints. China meanwhile is determined not to be distracted from its ambition to be the prime superpower by 2117. Pakistani diplomats are to be complimented for persuading Prime Minister Nawaz Sharif to attend the congregations at Beijing and in Riyadh. He stood in the front line at both, physically and metaphorically. Prime Minister Modi abstained from both. India may well regret that Gandhian act of self-abnegation. Has India anticipated how China’s declared plan to invest in Pakistan’s agriculture could impact the Indus Waters Treaty? That treaty weaned Pakistan off PL 480 dependence. If Pakistan were to become the granary of China, how would this affect Sino-Indian relations? There is a riparian higher than India’s Upper Riparian.